Raccoons are highly adaptive nocturnal mammals endemic to North America but found as far as Europe, including England and Germany, and Asia. These opportunistic omnivores will eat anything from fruit and trash to fish and mice. While preferring to stick to wooded areas, including parks, they will venture into backyards and urban areas in search of food. Baby raccoons are called "kits" or "cubs" and are less than 6 inches long. Their fur is grayish-brown. They have a faint bandit mask, and their tails are short and very faintly ringed. 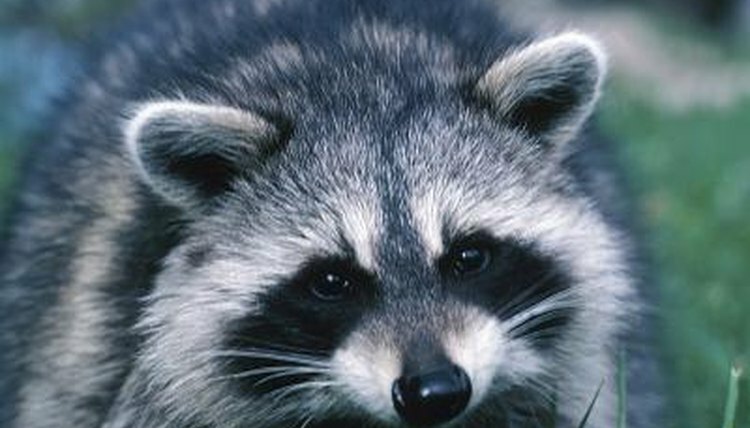 The adult North American raccoon’s most notable feature is its bandit’s mask, which is formed by black fur around its eyes. The mask appears to sit on the raccoon’s white face. The tips of a raccoon’s ears are also white. A brown-black streak runs down from its forehead to its nose. Its tail has rings of alternating light and dark fur. A raccoon’s coat is typically light to medium gray. Raccoons found in Europe, particularly those in England and Germany, tend to have darker gray, sometimes almost black coats. They still have the characteristic bandit's mask and ringed tail. Albino raccoons have yellow or white fur. Unlike other raccoons, albinos lack the bandit's mask and ringed tail. Albino varieties are extremely rare. Some have been spotted as recently as 2012 in California and 2011 in Toronto, Canada. Since raccoons are nocturnal, their gray fur does help to camouflage them. The bandit's mask, however, helps these critters recognize one another quickly. The mask also helps to reduce glare, which in turn enhances their night vision and increases their odds of finding food and steering clear of predators.